In the wee hours of the morning, people are often visited by visions of faceless, nameless demons who prey on their anxieties, denying them sleep. In my case, the demon that visited me on a recent sleepless night has both a face and a name: Bryan Adams. And like a vampire, he wouldn’t leave because I invited him in. It was 2:37 this past Tuesday morning and I couldn’t sleep. The minutes were ticking by like hours and my mind leap-frogged back-and-forth to a series of earth-shaking questions: When did I last change the oil in the car? Do hummingbirds have heart attacks? Who was the MVP of the 1992 World Series? I didn’t have any of the answers so I tried calming my mind by counting sheep, which only made me hungry for lamb chops. Maybe a song would help. If I could hum a few bars from a familiar song, maybe it would ease me to snooze-ville. I closed my eyes, opening the music vault stored in my head and sifted through the dusty archives. Unbidden, Adams’ “Summer of ‘69” slid onto the turntable and began playing. It went on for four days. For those of you unfamiliar with Bryan Adams, he was a pop-rock mainstay of the 1980’s, the decade of my youth. Hailing from Canada, he has sold millions of records worldwide, won numerous awards and toured extensively. He even has a philanthropic educational foundation. Honestly, I have nothing against Bryan Adams. As a teenager, I wasn’t really into his music, but was aware of it because it was always on somewhere: on the car radio, on a movie soundtrack, at high school dances. In fact, it wasn’t until last Tuesday that I began to wish him ill will. Maybe death by moose stampede or some other odd thing that Canadians’ fear. I’ve had songs stuck in my head before. Usually, I can purge them by listening to the actual song, kind of like holding your breath to stop a case of the hiccups. So, with “Summer of ‘69” stuck on a tortuous loop in my skull for a fourth night, I rose from bed, found my ear buds and sought the offending song out on the internet. I listened to it once. My wife, bleary-eyed and half-asleep stood in the doorway. “I’m listening to Bryan Adams,” I replied. She gave me a look that said she needed more information but was too tired to attempt an extraction. She turned off the light and shuffled back to bed. I listened several more times, just to be sure the song was forever scrubbed from my hard drive and climbed back into bed, ready for sleep. Still looping around on repeat. I lay there wondering if there was a Bryan Adams support group online, and if there wasn’t, maybe I should start one. So, I stumbled back to my laptop and began scrolling for ways to rid songs from ones head that don’t involve alcohol or corrective surgery. Surely some college student somewhere had discovered a cure while amped up on Red Bull. My desperate research led me to discover that the phenomenon of having a song stuck in your head is called an “ear worm.” More scientifically, it is referred to as “Involuntary Musical Imagery”, or IMI. Several scientists with very stern-sounding names have even studied this condition. My mind flashed to a vision of men and women in lab coats, clutching clipboards and poking bubbling beakers while they listened to Van Halen or The Smiths over and over again. There were also dozens of less-than-helpful suggestions to rid oneself of an ear worm, including chewing some gum, doing a puzzle, or, as I had recently tried, listening to the song. After several ear-bleeding nights of torture, I was able to remove “Summer of ‘69” from my head. I hit it with a mental hammer until the vinyl of the record turned to fine powder. I was free. I settled into bed, mind blissfully blank as I steered myself towards much-needed, Bryan Adams-free sleep. I chuckled softly. 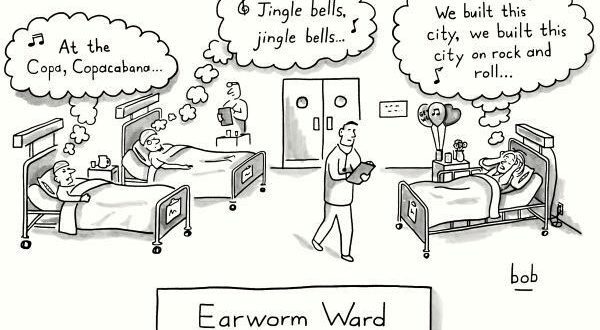 Ear worms? How silly. It’s just music. I looked at the clock. It was 5:58 and I was now imagining a completely different kind of ear worm, the kind that squirms around in my ear canal, laying eggs while being generally slimy. Now I ponder a new question: what kind of music kills worms in your ears? My guess is Justin Bieber but I’m honestly too terrified to experiment.